It’s my birthday. I am officially 29 21. I went to work today, drove home in a snowstorm and tonight I will study for my finals. There doesn’t seem to be much excitement in birthdays after you turn 21. What’s there to look forward to? In exactly 6 years I am eligible to run for President of the US. That’ll be thrilling. I never minded having a birthday close to the holidays. There is usually snow in Minnesota on my birthday. That makes it good enough for me. 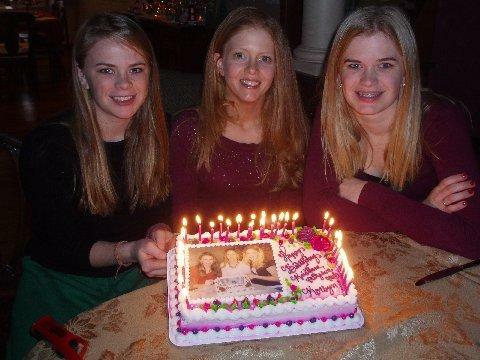 About 4 years ago my family started a new birthday tradition for me and my 2 cousins who also have December birthdays. We had pictures with our faces xeroxed onto a cake. The next year the cake had the picture of us holding the cake from the previous year, and so on. Sounds silly, and it is. But I love this new tradition and I am hoping that when we are 78, 90, and 80 respectably, we will have 65 years of infinity cake pictures. This entry was posted in Blogroll, family, Fine Dining, funner, Holidays, Life and tagged 29, birthday, cake, family, traditions. Bookmark the permalink. happy birthday late, i’m just hoping some of that cake finds its way into your garbage. raccoons heart cake. and shiny things. Leftover cake? Your funny keywork. wishful thinking. maybe there’s some frosting on the box that cake came in. HAPPY BIRTHDAY! u r now officially older than me! For a little while at least!